Have employees or temporary workers who need to share a Windows 10 computer? No problem — here's how to do it. Two or more people sharing one PC for work sounds like a recipe for disaster. Do you really want a co-worker to read, edit and delete your files and folders; use or delete your applications; or make system-wide customizations? In some offices, however, computers need to be shared between two or more workers, or handed off to a temporary worker — without being completely wiped each time. And Windows 10 has great tools for allowing multiple people to share a single PC without any of those problems. In this piece, I'll show you what to do. This article has been updated for the Windows 10 October 2018 Update (version 1809). If you have an earlier release of Windows 10, some things may be different. 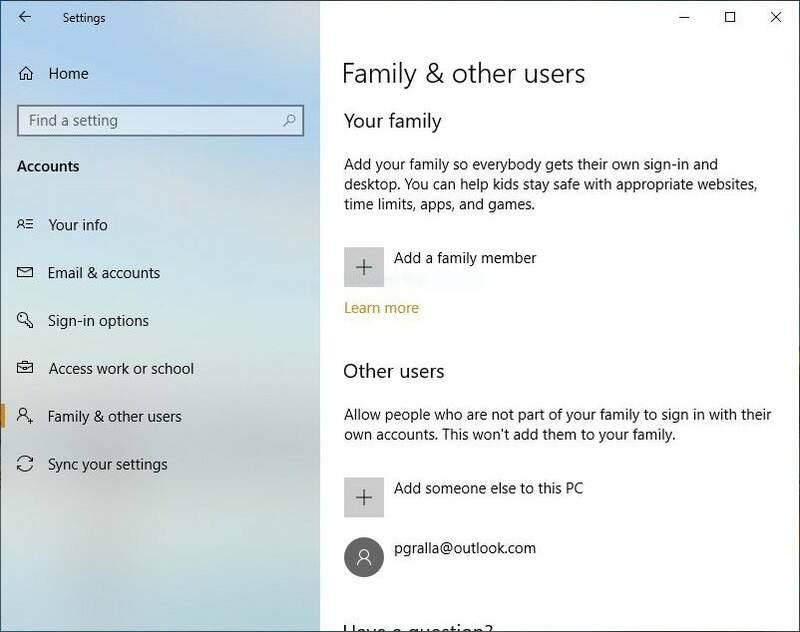 Windows 10 makes it easy for multiple people to share the same PC. To do it, you create separate accounts for each person who will use the computer. Each person gets her own storage, her own applications, her own desktops, her own settings, and so on. One person, the PC's administrator, sets up and manages all the accounts, including a variety of system settings that only the administrator can access. The administrator account is established when Windows is first installed or used on the machine. In the screen that appears, enter the email address of the person for whom you want to create a user account, click OK and then click Finish. The user's name now appears on the Family & other users accounts page. When an account name is clicked, it will show all of the accounts on the machine. It also appears when you click the icon representing the current user of the PC, midway down on the left side of the Start menu when you click the Start button. If you're the owner of the new account, there are two ways to start using it. You can click the icon representing the account of the current user of the PC, midway down on the left side of the Start menu when you click the Start button. That displays all the accounts on the PC. Click your account name and log into your account with your Microsoft account password. Or you can restart the PC: The Windows login screen will now have two accounts on it — yours and the administrator's. 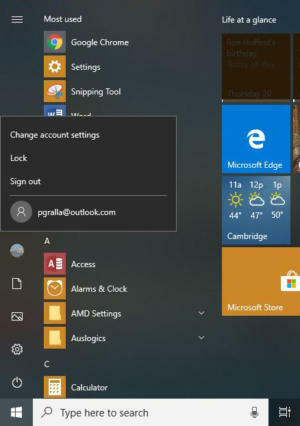 You can click your account name and log in with your Microsoft account password. The account will have its own separate OneDrive storage. Each user's local files and folders won't be accessible to the other. You will see the Windows apps you've installed, but not anyone else's, and vice versa. Given that it's a Microsoft account, files and settings will sync with all other devices connected to your account. Creating a shared PC if the other person doesn't have a Microsoft account takes a little bit more work. You can add a user who doesn't have a Microsoft account. Now you can add a user name and a password. The person's account name will now show up the same way as if you had created one using a Microsoft account. When you create an account for someone in this way, it's called a local account. Unlike a Microsoft account, it won't sync settings between devices and it doesn't give access to OneDrive. In addition, when someone has a local account, they won't be able to download or install any apps from the Microsoft Store. They won't be able to install desktop applications on their own, either — when they try to install them, they're prompted for the password of the administrator's account. So an administrator will have to be nearby to type in the password in order for them to install desktop applications. Once your account has been set up, it's easy to switch from the account currently running on the machine to your own. If someone else is currently using Windows 10 on the machine, and you want to use it, you can click the Start button, click the icon representing the current user’s account midway down on the left side of the Start menu, then click the account to which you want to switch and type in the password. You can, of course, also log in from the lock screen, which displays all of the user accounts on the machine. To see which users are currently signed in, click the Start button, then click the icon representing the current user’s account midway down on the left side of the Start menu, to see all of the machine's accounts. Look underneath each account. The words “Signed in” will appear under the appropriate accounts. What does it mean that someone is signed into their account, even if they're not currently using it? When someone is signed in, Windows 10 saves the state of that person's user account — which applications the person was running, the files they were working on and so on. That way, when he switches back to using the account, everything will be in place, and he won't have to waste time launching apps, opening files and so on. This is useful, but it can be problematic as well, because it can lead to lost work. When a PC is restarted or shut down, all users on it are automatically logged off. So say someone is logged into her account and hasn't yet saved work — if the computer is switched to another account, and the person using that second account restarts or shuts down the system, the first person will lose her unsaved work. The upshot? It's always a good idea to log out of your account before letting someone else use the same computer. It only takes a moment: Click your account name at the top of the Start menu and then click Sign out. If you want to let another user have administrator access, it's simple to do. Select Settings > Accounts > Family & other users, click the account to which you want to give administrator rights, click “Change account type,” then click “Account type.” Choose Administrator and click OK. That'll do it. You can always change it back to a standard user account later using this same method. 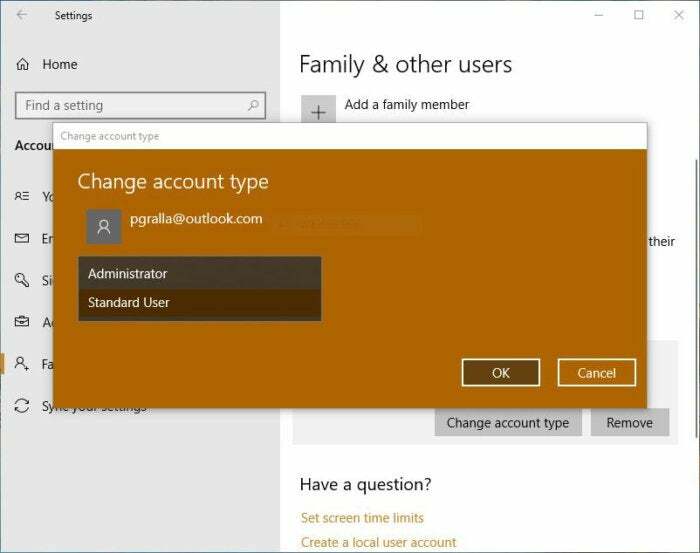 You can change a standard user account to an Administrator account. It's also easy to remove accounts — as long as you're the administrator. Select Settings > Accounts > Family & other users, click the account you want to remove and then click Remove. 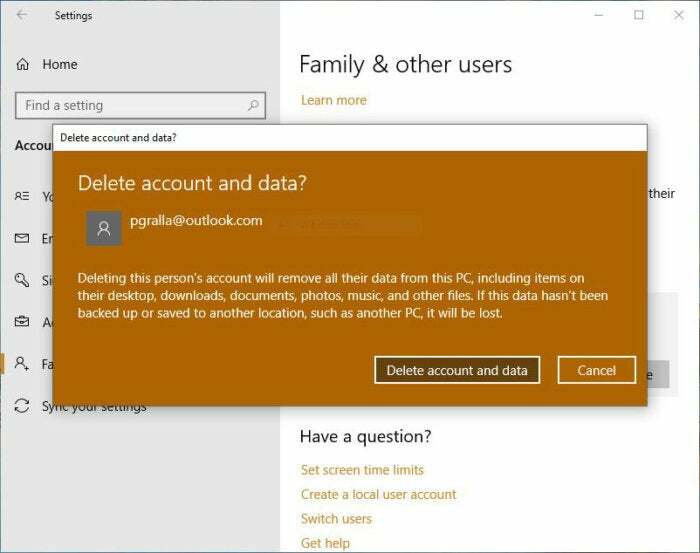 A screen appears warning you that when you delete the account, you also delete all data associated with it, which include files, desktop setup, apps, music and so on. Also, note that you can only delete an account if the person has signed out of Windows 10. When you delete an account, you also delete all data associated with it. Once you've got it in hand, you'll find that this is a simple and useful way for sharing a Windows 10 PC among multiple people. I've got one more tip for you: how to turn on something that is sort of a super-administrator account hidden in Windows 10. As I explained previously, the account you create when you install Windows is the PC's administrator account — it gives you control over how Windows 10 works on the PC, what other accounts can be created and so on. 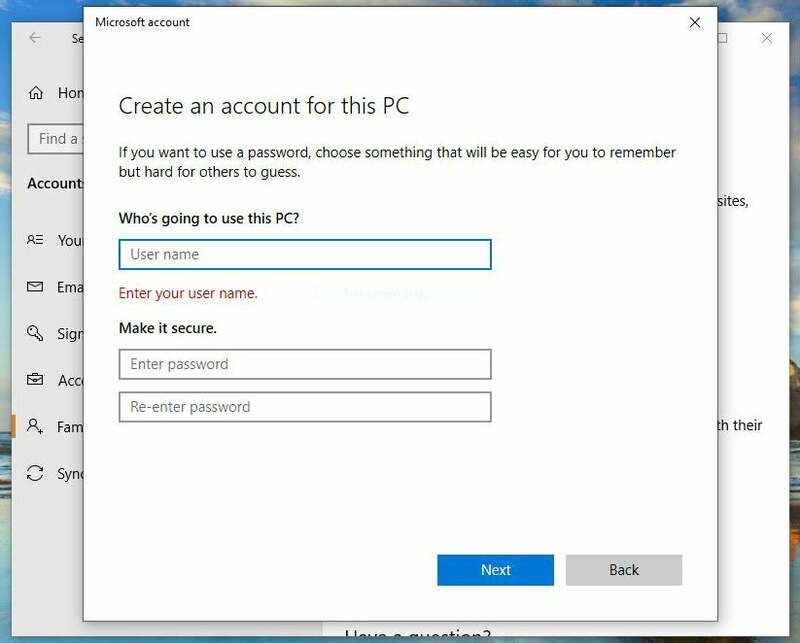 But Windows 10 also sets up a hidden administrator account during installation. This hidden account has one advantage over a normal administrator account — when you use it, you won't get any User Account Control (UAC) prompts. That makes it much easier to troubleshoot and customize Windows, because you won't be constantly bothered by those pesky UAC notices. Some people refer to this hidden administrator account as an elevated account, and a normal one as an un-elevated account. First, make sure that you're using your normal Administrator account. Then click the Start button, scroll down through your apps and click Windows System. Right-click “Command Prompt” from the drop-down menu that appears, then click More and select “Run as administrator.” The command prompt launches. Look in the prompt's title bar — it will read "Administrator: Command Prompt." At the command prompt, type net user administrator /active:yes and press the Enter key. That turns on the hidden administrator account. 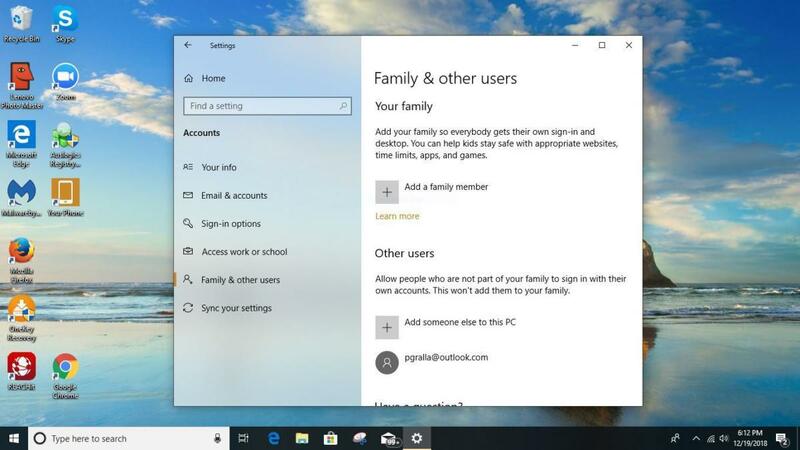 It will appear on the Windows 10 login screen and on the Start menu screen — just click it to use it as you would any other account. If you want to disable the hidden account, follow steps one through three, and at the command prompt, type net user administrator /active:no and press Enter. This article was originally published in March 2016 and updated in January 2019. This story, "Windows 10 quick tips: How to share a single PC" was originally published by Computerworld.